We enjoyed the view and the spaciousness of the house. We also liked having more than one bathroom. The home had everything we needed. I enjoyed being a guest in this beautifully updated house. I found the light cheerful colors to be uplifting, and just loved sitting by the wood stove, so homey and cozy. It's clean and spacious and well furnished. The neighborhood is quiet, almost every time I looked out a window I saw deer, so peaceful and park like. I know I will re-visit this place. I had the pleasure of staying at King's Haven for two weeks in September. This spacious private home has all that's needed for comfortable living! It has a beautiful up-to-date kitchen & dining room which is quite large. The four bedrooms and three satellite TVs easily accommodated seven of us. The property is well-kept, with several trees and a garden in the back yard. On some of the days we saw 2 or 3 deer sauntering through the yard. It's on a quiet street, in a nice neighborhood which is very safe. Almost like country living! Nearby is the bay inlet with a boat ramp and beach, from where you can see across to Canada! Elwah River valley scenery and the Olympic Mountains are only a short drive away. The view while hiking on Hurricane Ridge presented an aura of majesty! I highly recommend King's Haven for a get-away stay. These guys are all about customer service! Very nice, quiet, relaxing, private. Thank you for the excellent communication and for allowing us to check out late. We really appreciated that. Beautiful place, fantastic view, owners/property management company had thought of everything we might need during our stay. We had a wonderful time. Wonderful place. Very serene and loved the views and the wildlife, location was great. The staff were a delight to work with and so efficient!! This property is delightful. 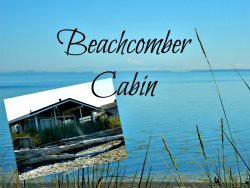 It offers privacy and a beautiful view, plenty of room for six adults, and is extremely well stocked, organized and maintained. Thank you! Very good and friendly service with lots of additional information what to do and where to eat. It's a lovely house near to the beach with very marvelous views ! The house was well equipped and had everything we needed. But I would definitely love to come back to your property! We had just the nicest conversations and interactions during our communications. The team went above and beyond to answer questions, listen to our suggestions/concerns, and promptly offered any help we needed. Most importantly, we felt they were genuine and down to earth- those things are oftentimes lost in this day and age but they can add or detract from your experience and impressions of an area. We loved it! We have stayed in many vacation rentals over the years and this is one of my favorites. It felt like home away from home while we were there. Owner cares about the property, was very clean and inviting (has a really nice cozy feel), beautiful view day and night, private and quiet, has many amentities available (washer/dryer, TV, fireplace, patio, kitchen supplies, coffee maker, etc), wonderful location by Dungeness Refuge and town of Sequim and not too far to Port Angeles yet still feel like you are away from it all. We had a few suggestions to help add to the experience at this property, and the owner was very appreciative and open to that. We really appreciated that. We also felt the rental price was very fair. Loved it here! Everyone was very friendly. Very helpful. This was a perfect home for weekend trip. Great little house in a good location. Especially good for families with pets. Loved the pet essentials that were waiting for us. It was a well maintained home and we slept well. Beyond wonderful. Top notch. Absolute dears. Amy and Lyle were the staff we interacted with and they were fantastic. Couldn't have been better. We then had a not so great experience with another realtor in the area which put how great they were in further relief. We were very sorry we couldn't have stayed longer at The Cedars. Amy was very thorough in sending us instructions on how to get to the property and answering various questions. When we arrived we became aware that my 88 year old mother was going to need a bar on the bathtub on the first floor to get in and out safely. When we called to inquire if they had one or where we might get one Amy asked Lyle to find one for us. He showed up later with three different ones to try. It was unbelievable. We wanted to take it with us as we thought we might need it at the next house but it was clear that they had been willing to pay for it. Lyle helped put it on the tub and was a fount of information about the area. Customer service gets a 12 out of 10. Wonderful. Wish we could have stayed longer. Your owners hopefully know how great you are at representing their homes. Great house for vacationing with family or friends. Great location. Great view. Great kitchen. We really felt like we were coming home to a place we could relax and be comfortable after a long day of hiking. We really enjoyed sitting on the deck with a glass of wine listening to the tranquil sounds of the river. In addition, you have a local bald eagle that was a thrill to watch. The kitchen was set up perfectly for prepping and cooking. The only thing that I would update is the grill. very friendly to work with. they corresponded via email timely. Great place, clean and spacious. Centrally located to many of our recreation activities and close to Port Angeles for groceries and restaurants.